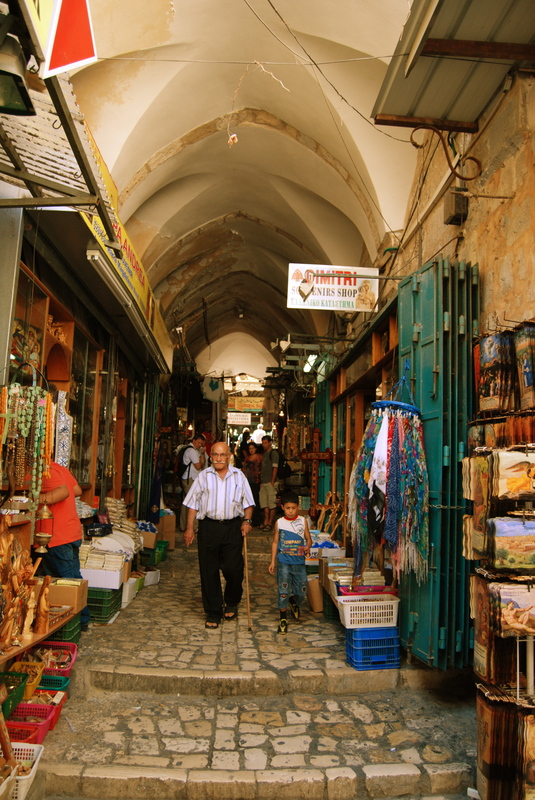 It was my third day in Israel and a day to explore more of the Old City of Jerusalem and Mount Zion. On previous days I had my initial tour of the Old City during my arrival and birthday, followed by a trip to the Dead Sea and Masada the next day. Mount Zion Hotel, where I was staying, is only a few minutes walk to Mount Zion. Probably, the hotel had been named as such because of its proximity and full view of Mount Zion. I had to walk from my hotel down along Hebron Road until its intersection with Hativat Yerushalayim, turning left on it and keeping right. Then I had to climb up the hill through a winding road. 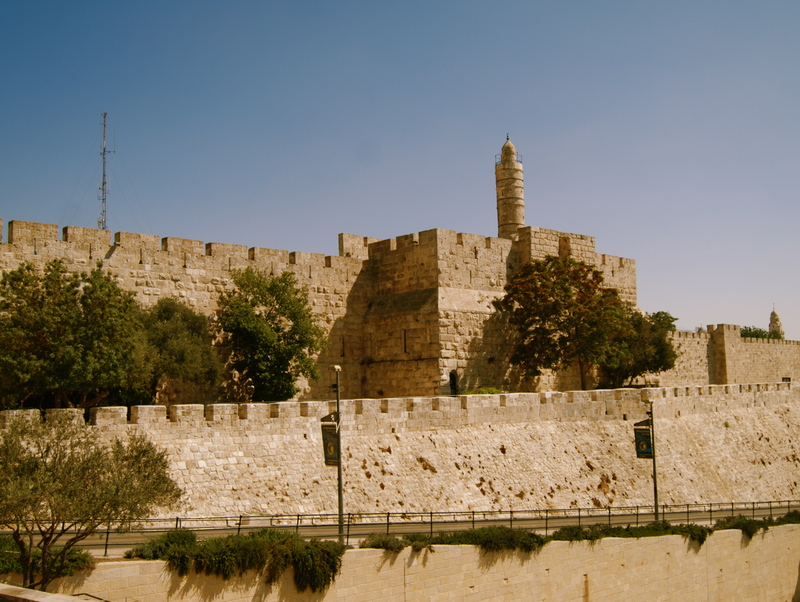 Mount Zion is located on the south-west side of the old city, outside the present walls. 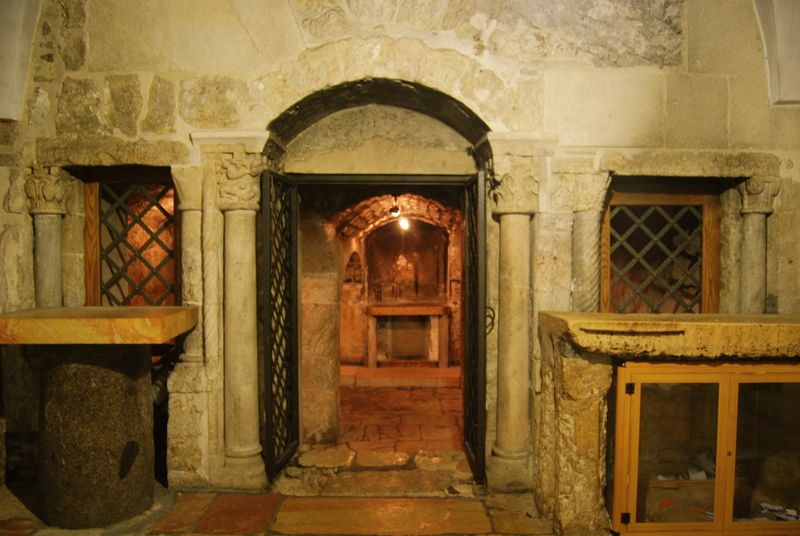 According to Christian tradition, Mount Zion was the site of the palace of high priest Caiaphas, and the location of the house where Jesus held the last supper. 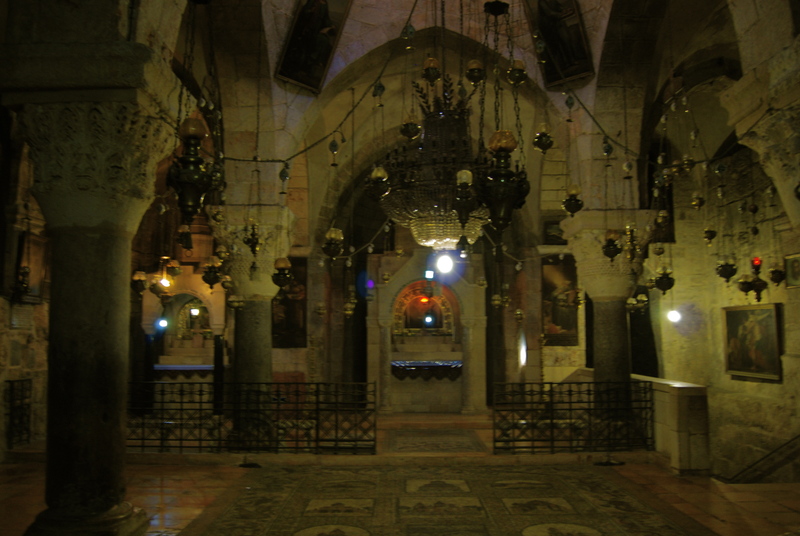 It was also the place where His mother Mary is buried. Therefore, the area has been prime site for Christian churches, institute and cemeteries. 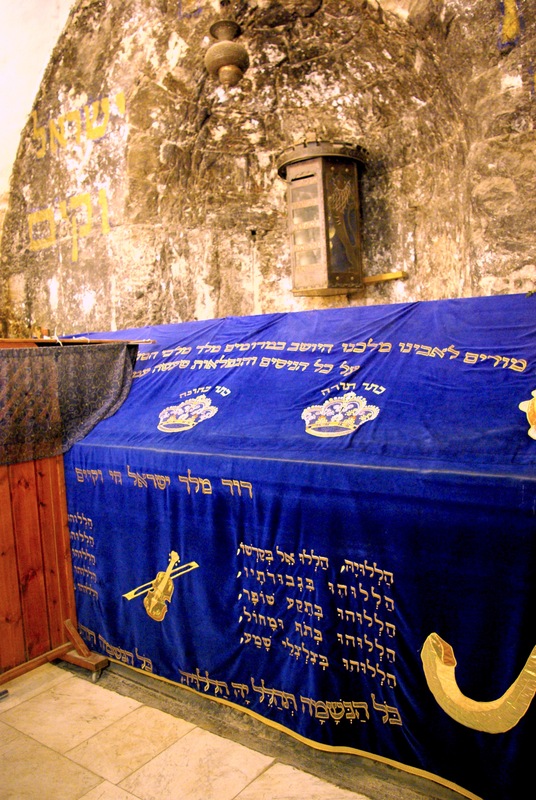 According to Jewish, Christian and Muslim traditions, this is also the site of the tomb of King David. 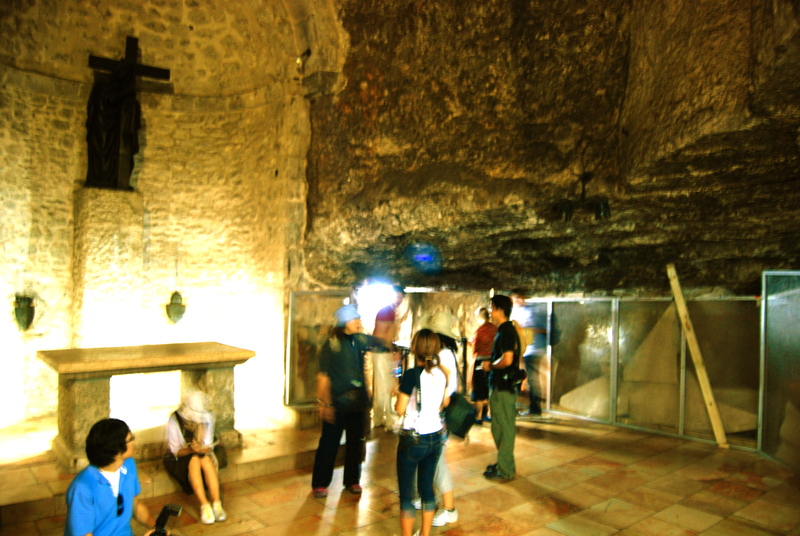 My first stop in Mount Zion was the Coenaculum (Upper Room) where Jesus sat with His disciples to celebrate the Passover Seder (Last Supper). 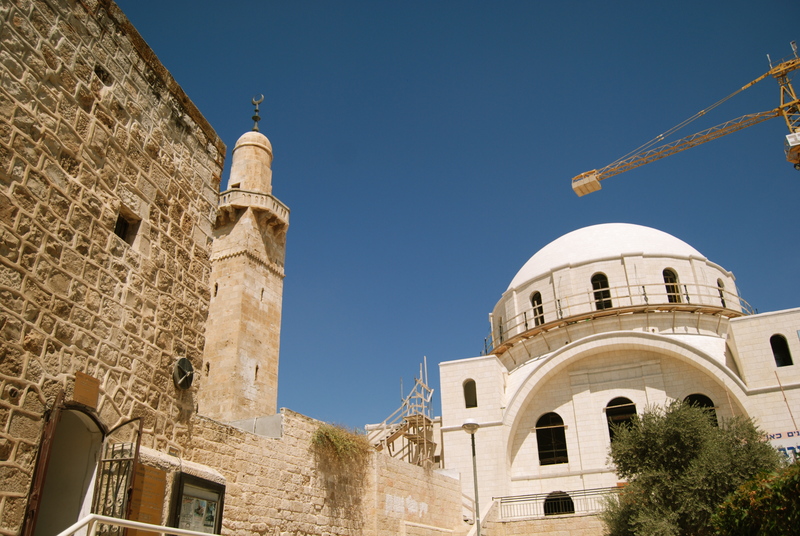 The building identified as the Coenaculum or the Cenacle is a small, two-storey structure within a larger complex of buildings on the summit of Mount Zion. 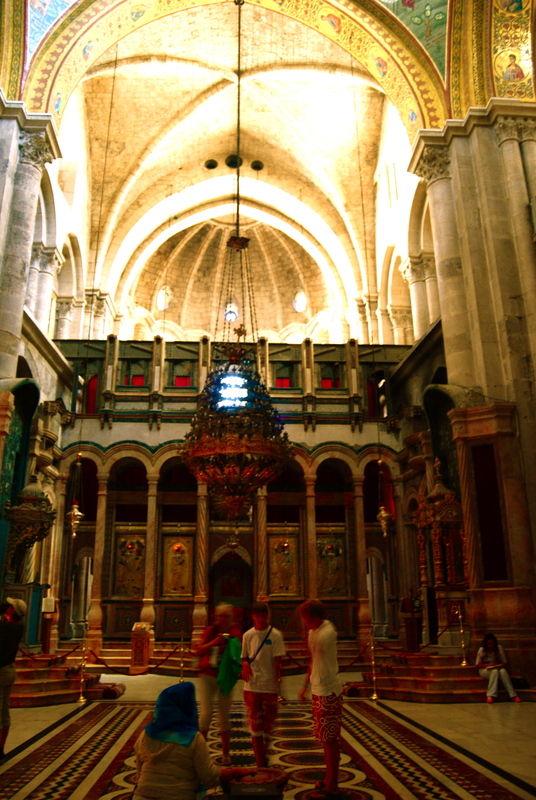 The upper storey was built by the Franciscans in the 14th century to commemorate the Last Supper. 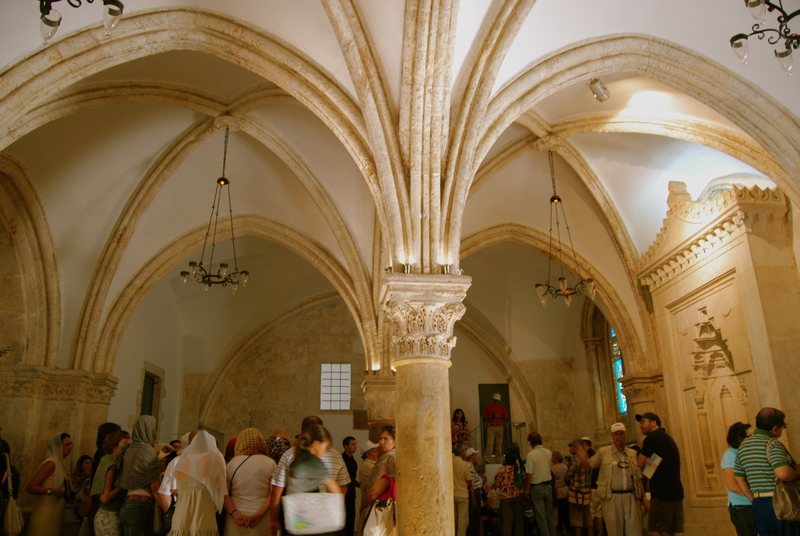 It is also identified as the “upper room” in which the Holy Spirit descended upon the Disciples at Pentecost (Acts 2:2-3). 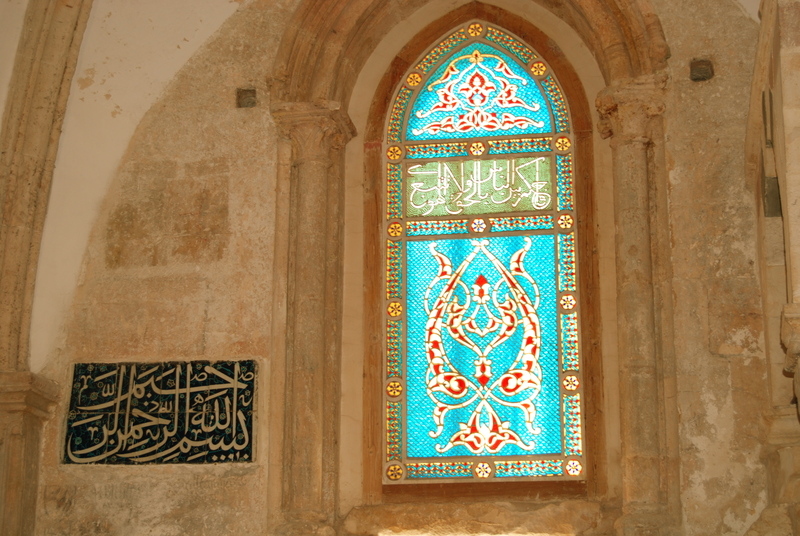 The sculpted mihrab, the Muslim prayer niche, was added in 1523, when the Franciscans were evicted from the building and the room converted into a mosque. 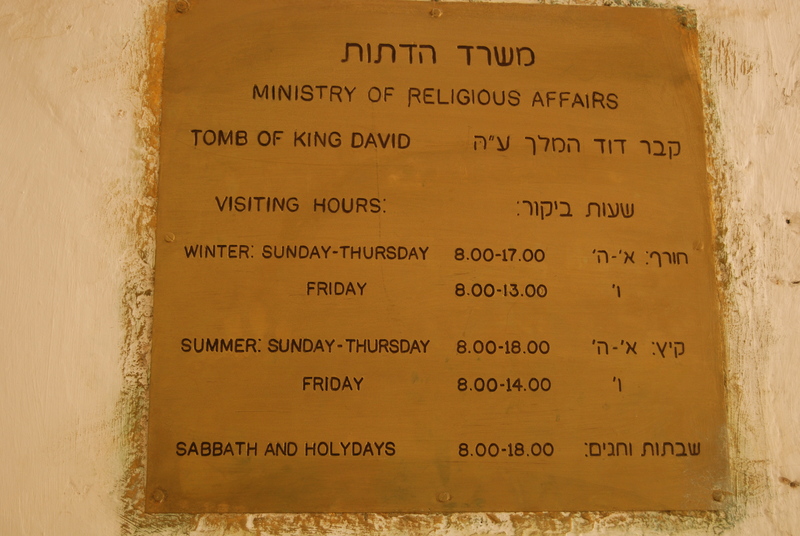 The ground-floor room beneath the Coenaculum contains a cenotaph that since the 12th century has been known as the “tomb of King David” – even though the recorded burial place of the king was in the “City of David” on the Ophel Ridge (1 Kings 2:10). I entered the ground-floor room…..
…and got a glimpse of the tomb site. 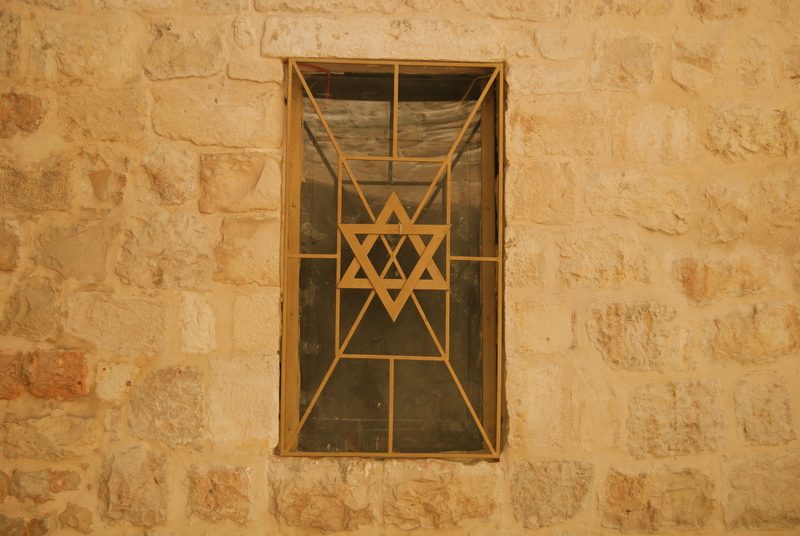 Just outside the tomb, a star of David caught my eye…..
…and King David’s statue as well. 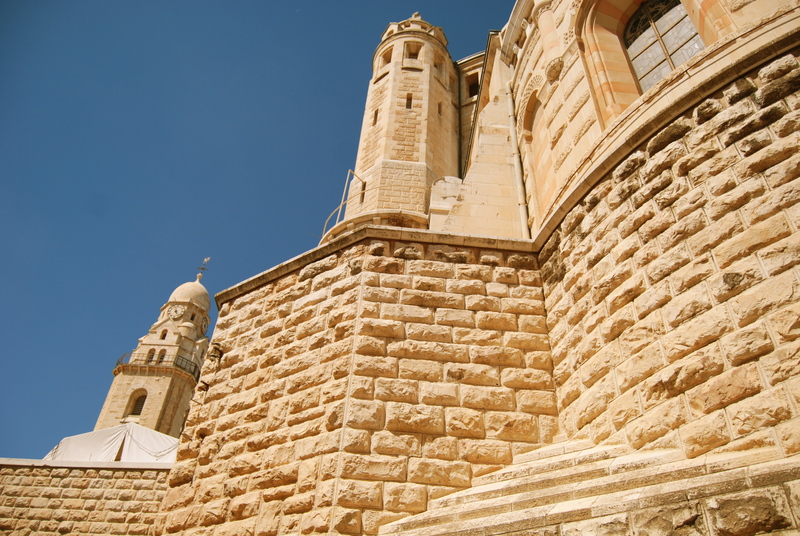 Just nearby outside the Zion Gate is the Dormition Abbey, a massive structure that resembles a mighty fortress. This Benedictine Basilica was built on the site where Virgin Mary have fallen asleep for the last time. It is topped by a high, domed belltower, a conical dome and corner towers. Out of regard for the nearby Muslim sacred place of Nabi Da’ud (David), which now occupies the building in the Upper Room I previously visited and where traditionally the Last Supper took place, the bell tower is set far enough away that its shadow does not touch Nebi Da’ud, and is therefore not directly accessible from the church. The present church is a circular building with several niches containing altars. The basilica’s highlights are the mosaics. 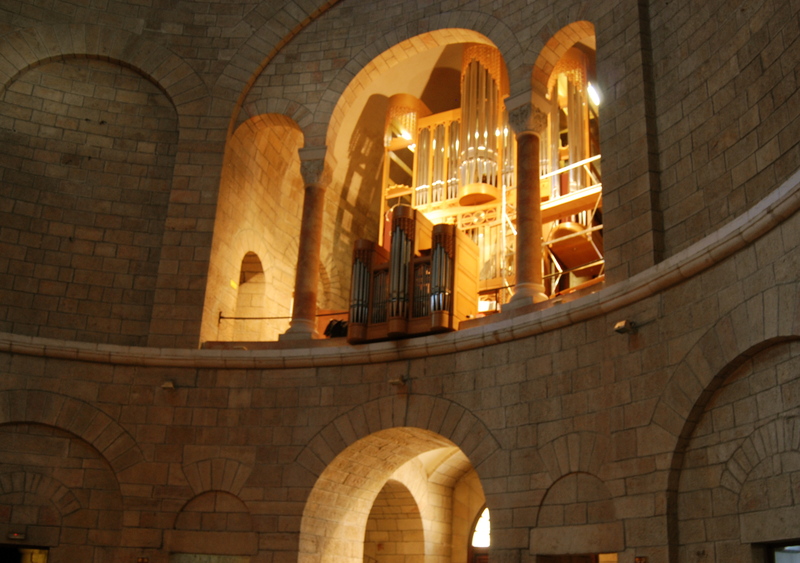 Two spiral staircases lead to the organ-loft and the gallery, from where two of the church’s four towers are accessible and to the lower crypt, the site ascribed to the dormition of the Virgin Mary. 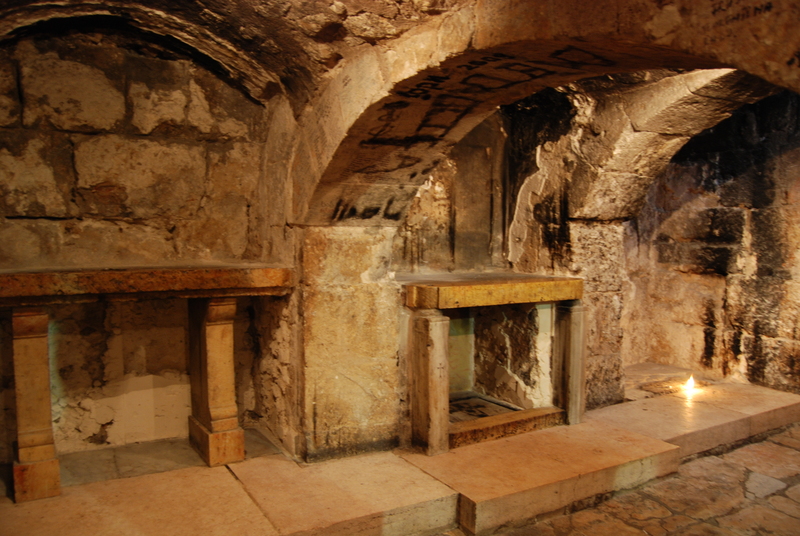 The lower-level crypt is the traditional site of Mary’s home and death. 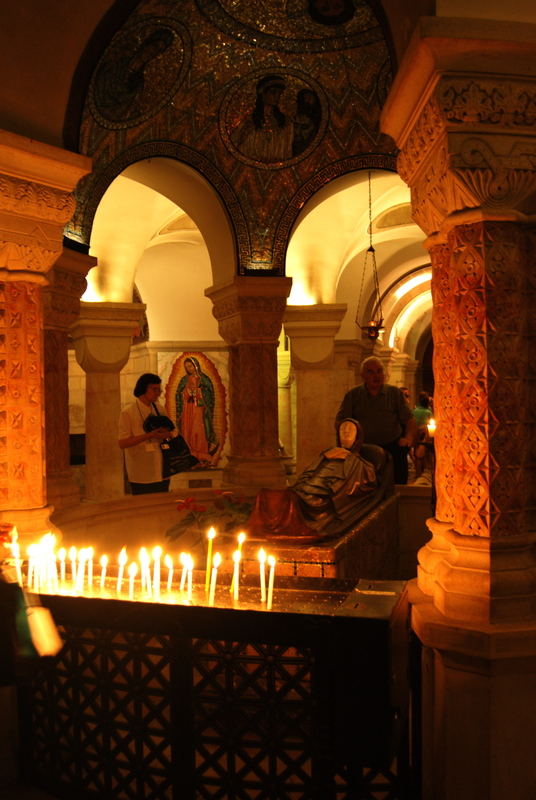 It is the memorial for the spot where Mary (mother of Jesus) fell into sleep before her burial and assumption into heaven. 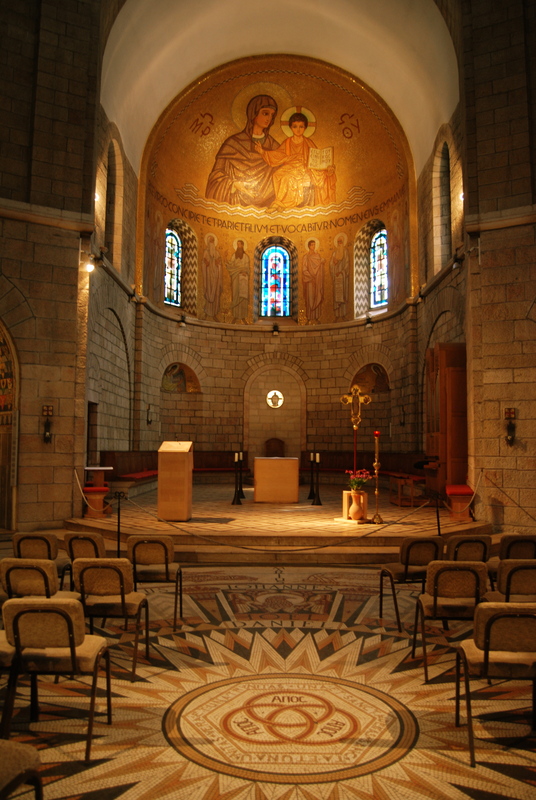 A circular pillared hall with ambulatories, it centers on the Chapel of the Dormition…..
…with a carved-stone figure of Mary in repose (dormitio). Above, a mosaic in the dome depicts Christ receiving her soul. 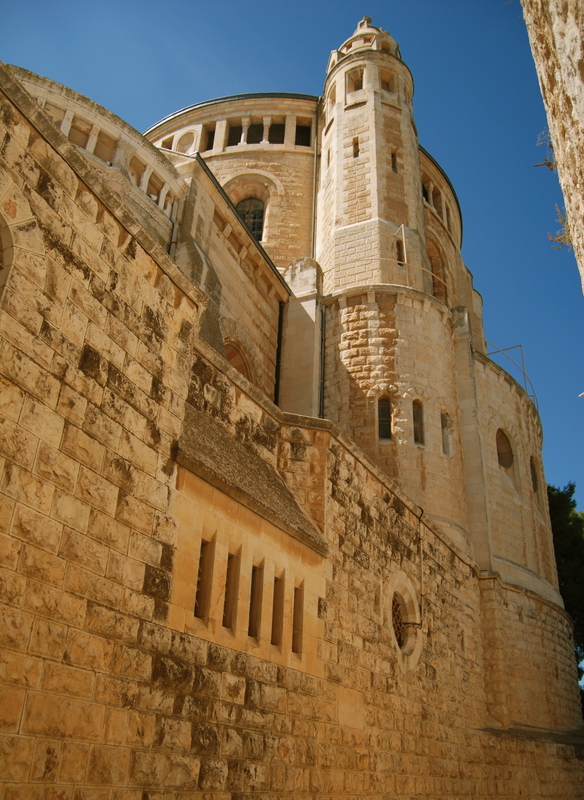 From the Dormition Abbey, I took a fews steps and walked inside Zion Gate to enter once again the walled Old City of Jerusalem. I walked around some more around the Jewish Quarter and I came across the Four Sephardi Synagogues. 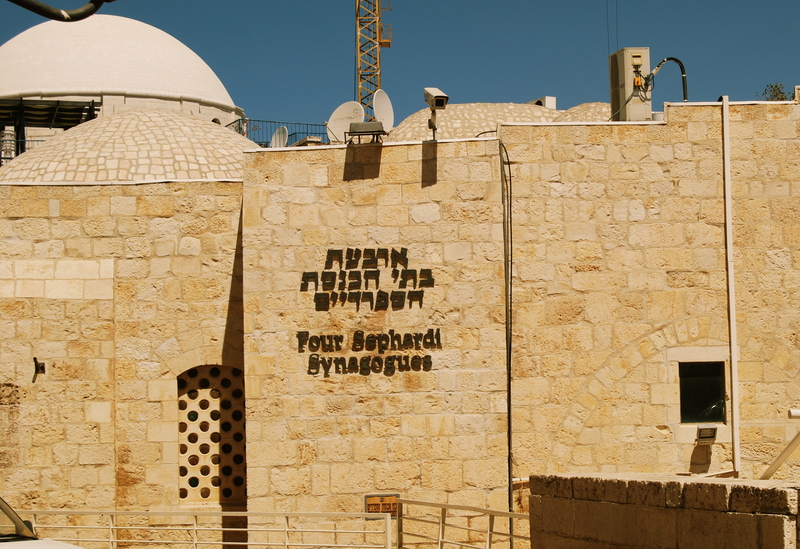 They form a complex which comprises four adjoining synagogues which were built at different periods to accommodate the religious needs of the Sephardic community, each congregation practising a different rite. First stop was the Yochanan ben Zakai Synagogue, also known as Kahal Kadosh Gadol, that stands on the spot of the beit midrash of the tanna Rabban Yochanan ben Zakai who established the Tsanhedrin in Yavneh after the destruction of the Second Temple. The current building was constructed at the beginning of the 17th century. 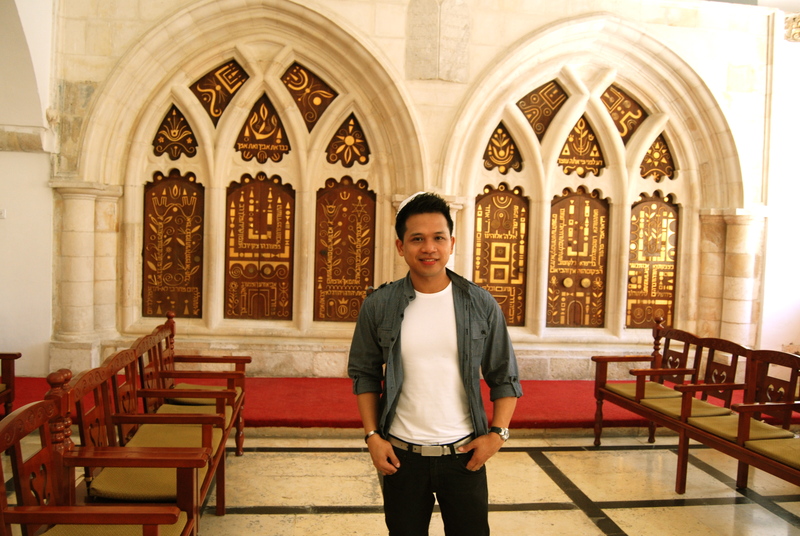 Well, an Arab guy offered his services as a tour guide for a small fee and he also acted as my photographer. 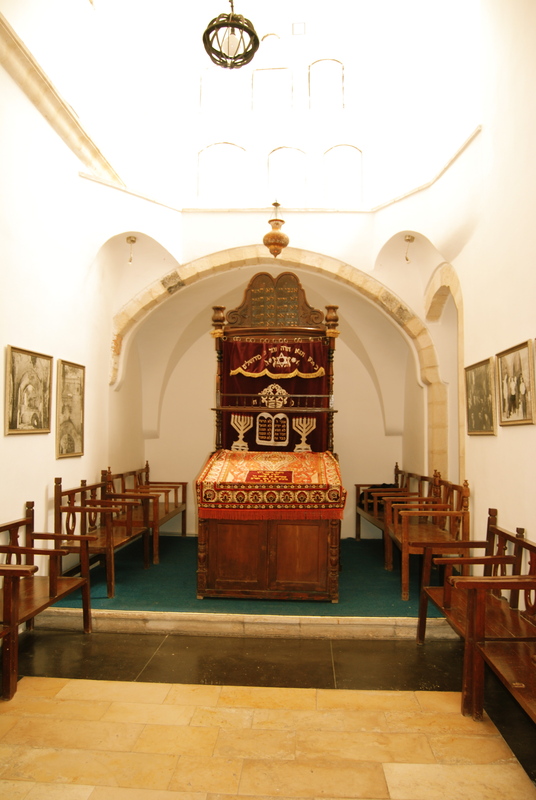 The Emtsai Synagogue or Middle Synagogue, also known as the Kahal Tzion Synagogue, forms the central chamber of the complex. 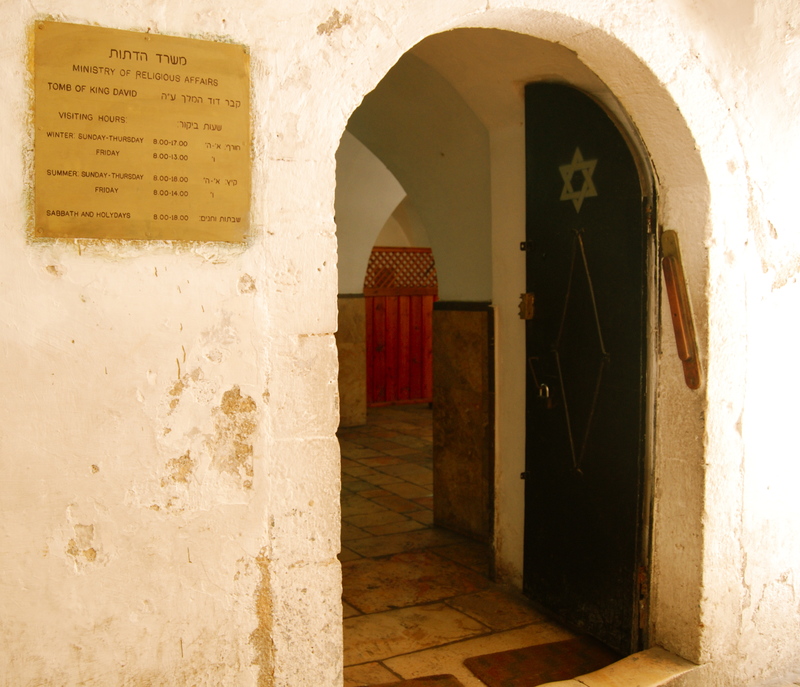 It was originally a courtyard which probably used as the women’s section of the Rabban Yohanan Ben Zakai synagogue. During Sukkot (Feast of Tabernacles) it could be converted into a sukkah for the worshippers. With the growth of the community, it was decided during the middle of the 18th century to roof the yard. It was turned into what is today known as the Middle Synagogue, due to its location in the “middle” of the other three synagogues. 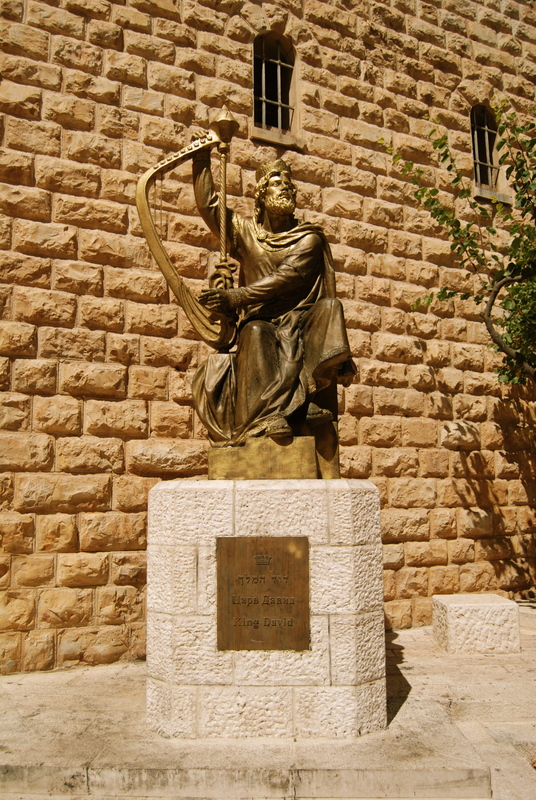 Another synagogue was established in the 16th century and named after Elijah the Prophet. This synagogue is the oldest of the four. 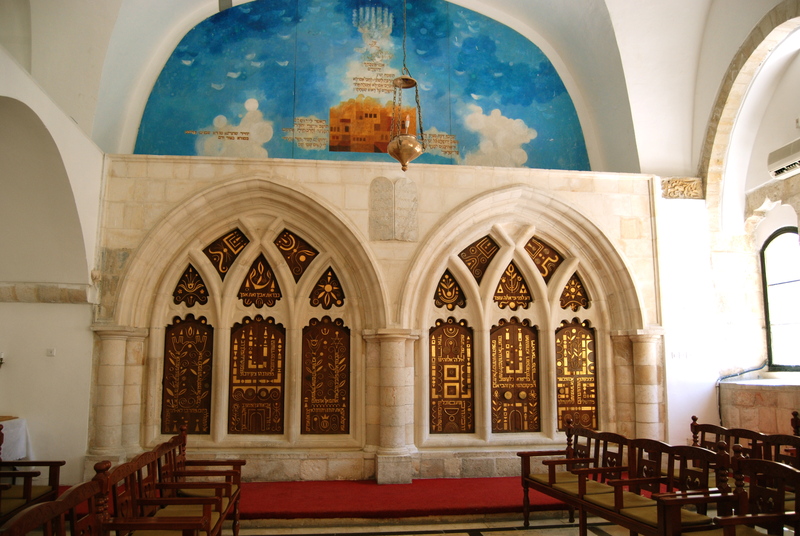 The Eliyahu Ha’navi Synagogue mainly served as a beth midrash for Torah study. It was only used for prayer on festivals. It was a short but informative tour of the synagogues. After my quick Jewish Quarter revisit, I finally went directly to the Christian Quarter. 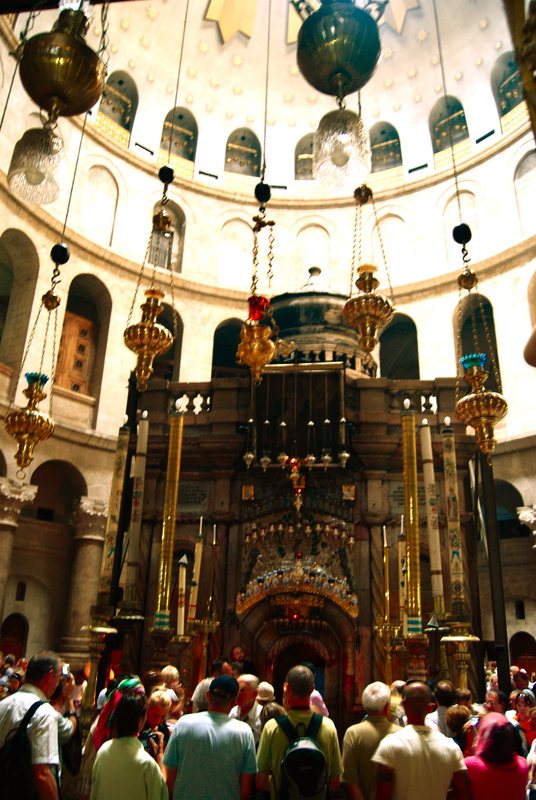 Seen here is the silver-gray dome of the Church of the Holy Sepulcher, considered as Christianity’s holiest site. 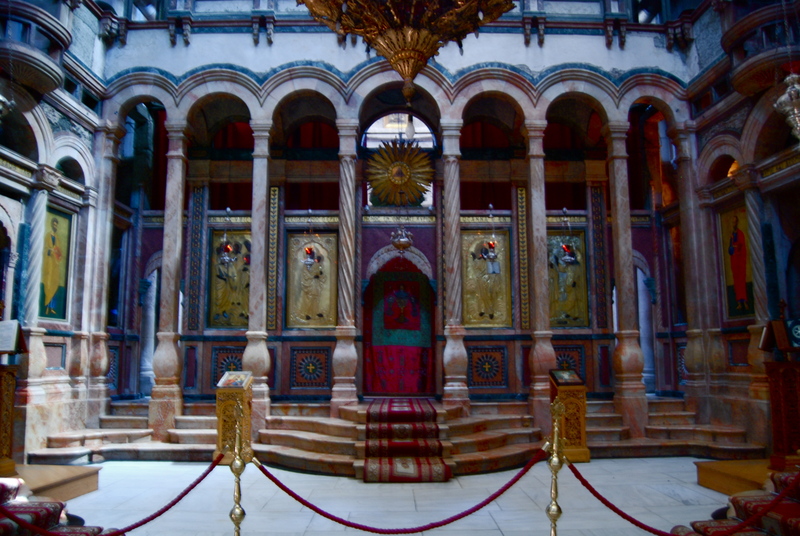 This is the main entrance to the Church of the Holy Sepulchre. 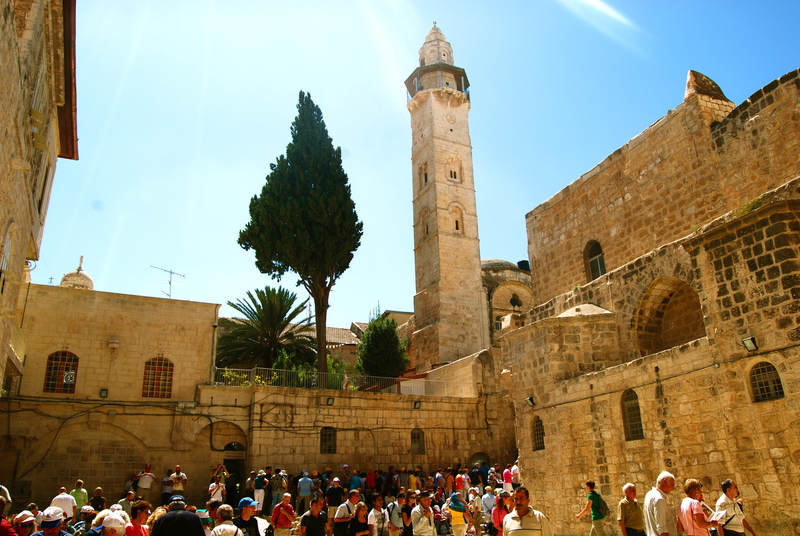 As I faced the opposite side from the entrance and atrium of the Church of the Holy Sepulcher, the imposing tower of the Mosque of Omar rose above the delirious crowd packing the alley. 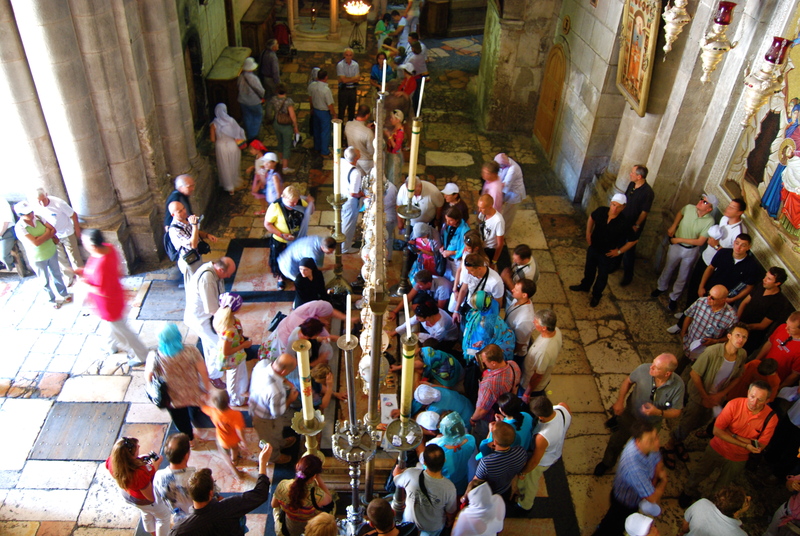 I have extracted a map from www.sacred-destinations.com of the Church of the Holy Sepulcher for a better perspective of the tour I made around the compound. 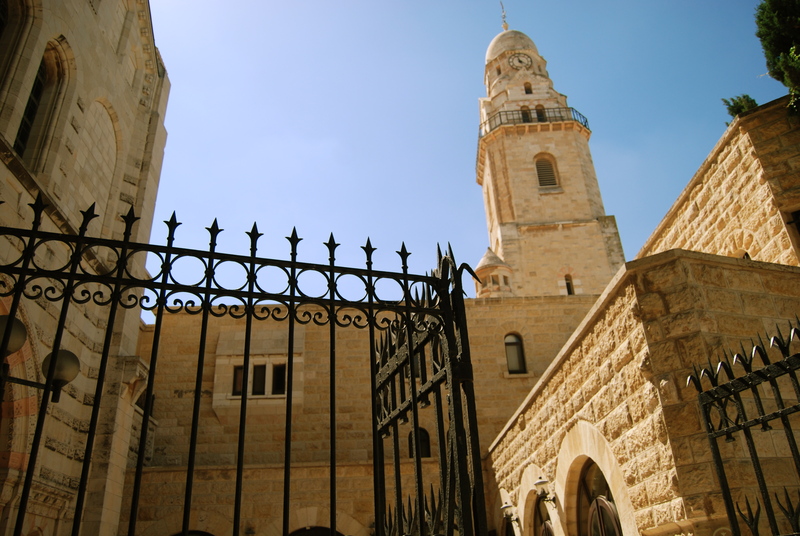 The church is home to Eastern Orthodoxy, Oriental Orthodoxy and Roman Catholicism. Anglicans and Protestant Christians have no permanent presence in the church. 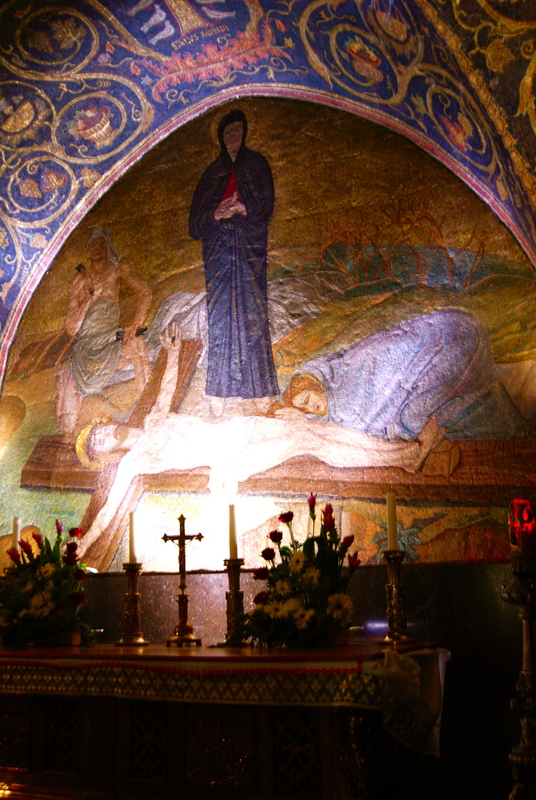 At the church entrance, a mosaic of Jesus being taken from the cross, being prepared for burial and being entombed adorns the wall facing the entrance. 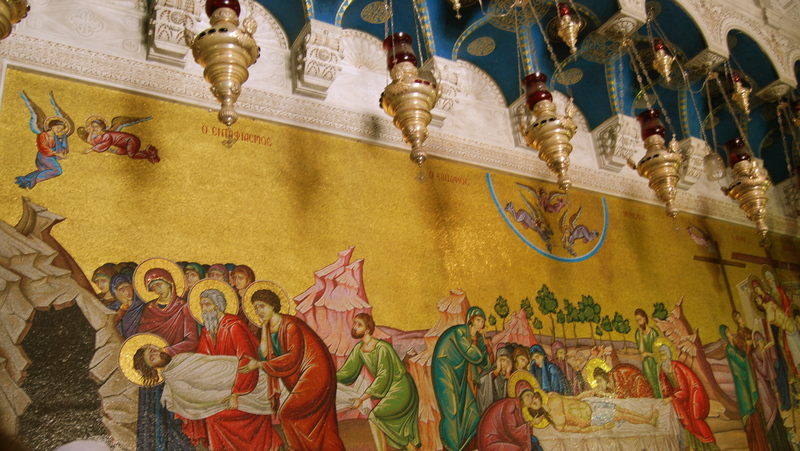 Just beneath the painting, is the Stone of the Anointing or Stone of Unction, believed to be the spot where Jesus’ body was prepared for burial by Joseph of Arimathea. 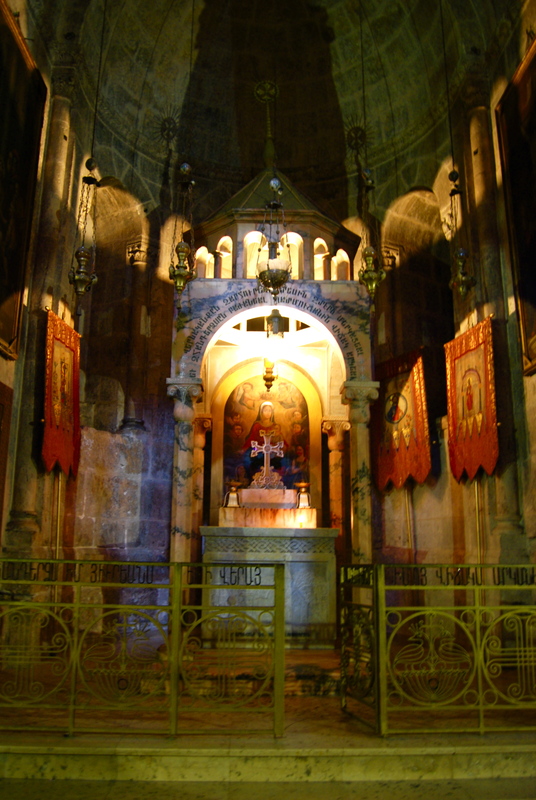 The lamps that hang over the stone were contributed by Armenians, Copts, Greeks and Latins. 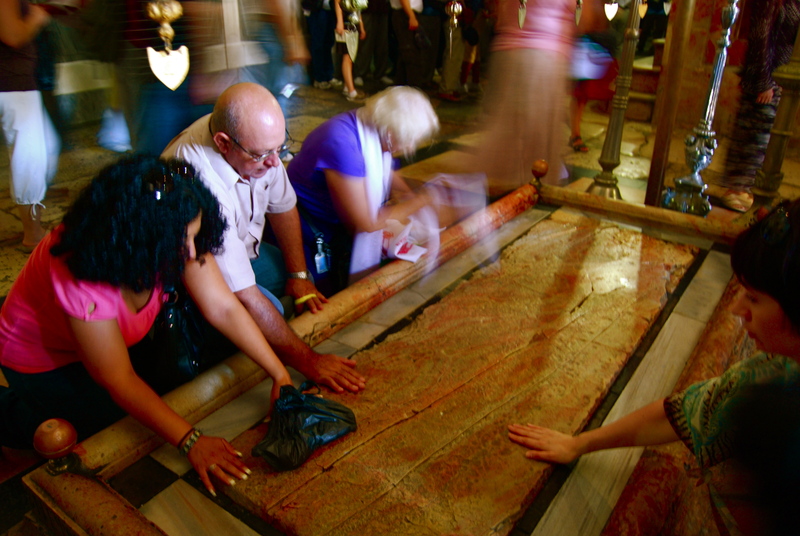 Christians belonging to certain sects venerate the stone. Here is a closer look at the wall mosaic. 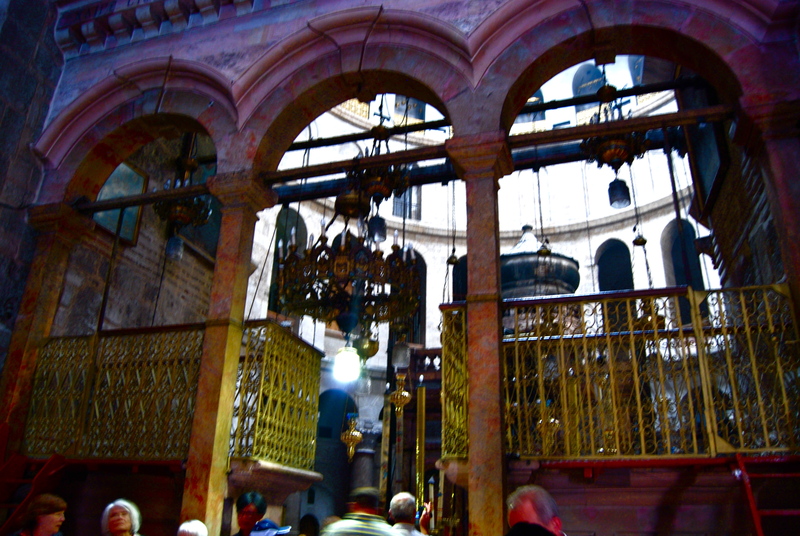 Further inside to the west of the Stone of Unction is the focal point of the Holy Sepulcher Church. 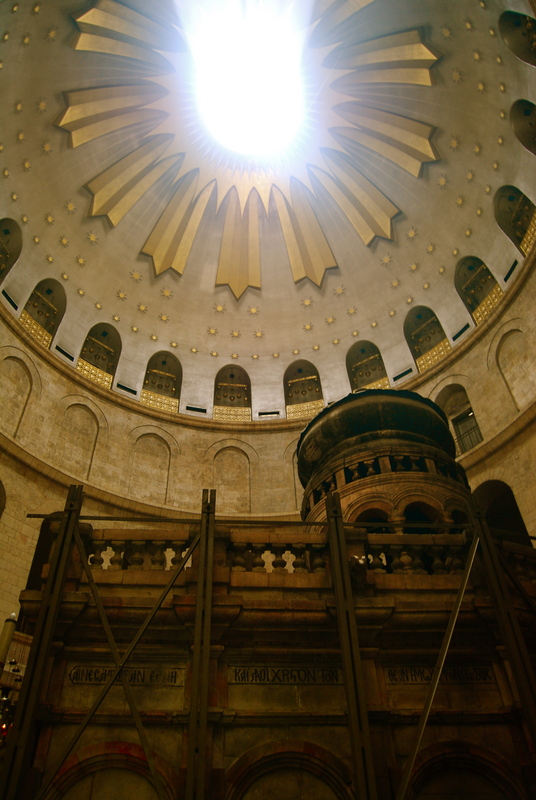 Underneath the large dome is the Tomb of Christ itself, enshrined in a large, boxy shrine. The shrine, referred to as the edicule, is supported by scaffolding on the outside making it unattractive. 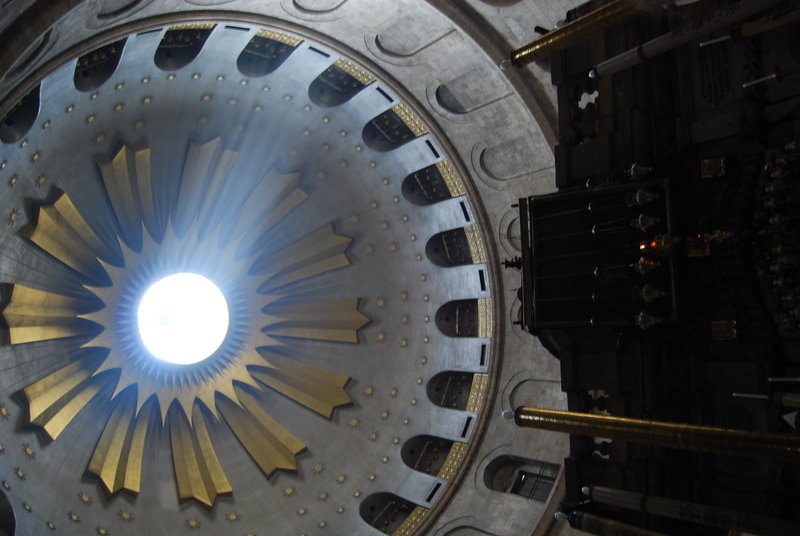 The dome is decorated with a 12-pointed star whose rays symbolize the outreach of the 12 apostles. The diameter of the dome is about 20.5 meters; the height is 34 meters. 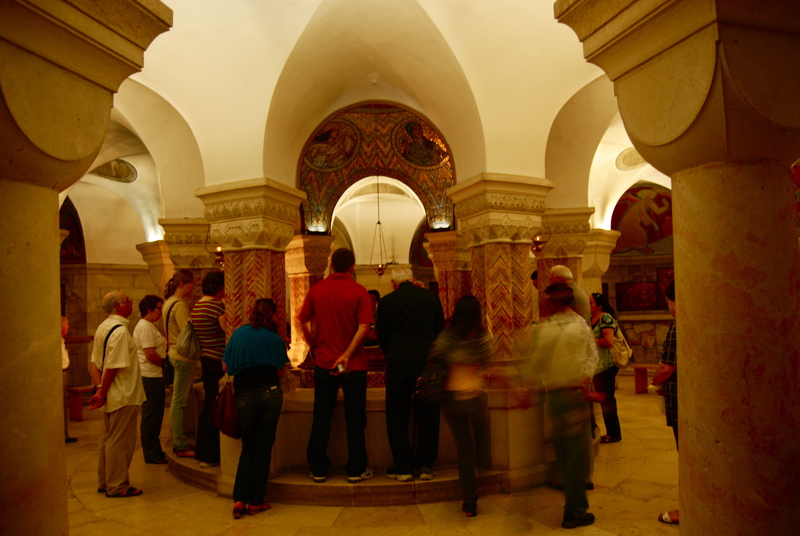 A large crowd was patiently queueing up to see the inside of the edicule…. ..and the rest were standing in awe. 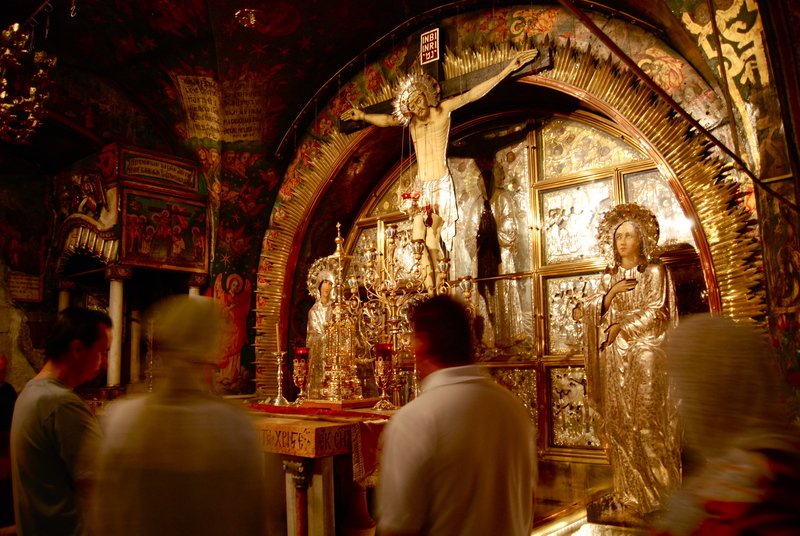 Just across the Tomb of Christ is the Catholicon, or Greek Orthodox cathedral…. ……with the thrones of the Patriarchs of Jerusalem and Antioch. 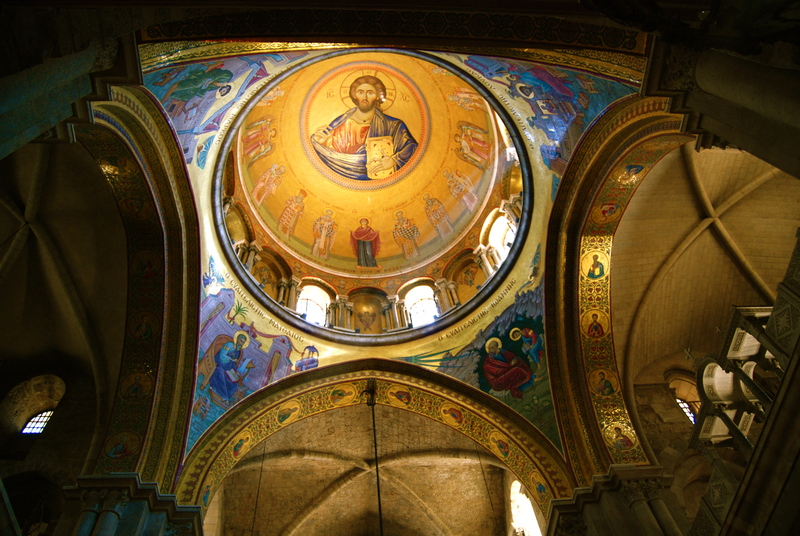 Above it is the “Pantokrator” mosaic. It depicts Christ as the “Almighty”, “All-Powerful”, “Omnipotent”. 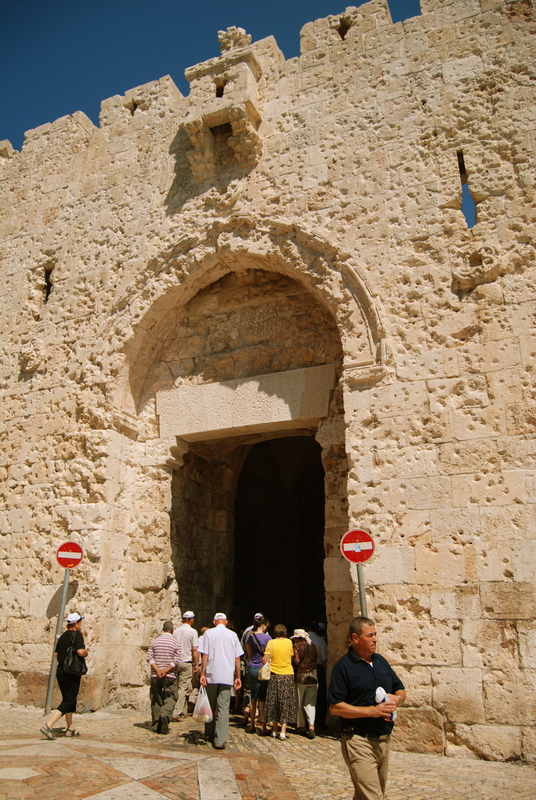 Going back to the entrance, a stairway on the right leads to Calvary (or Golgotha), the place where Jesus was crucified. 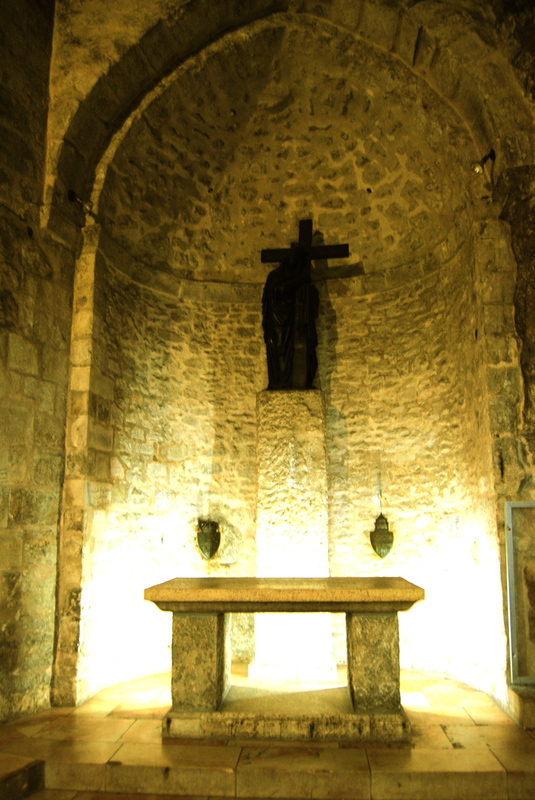 The first chapel is the Catholic (Franciscan) Chapel of the Nailing of the Cross, which is Station 11 on the Via Dolorosa. Shown here is the 12th-century mosaic of Jesus being nailed to the cross on the vault and a Medici altar from Florence. 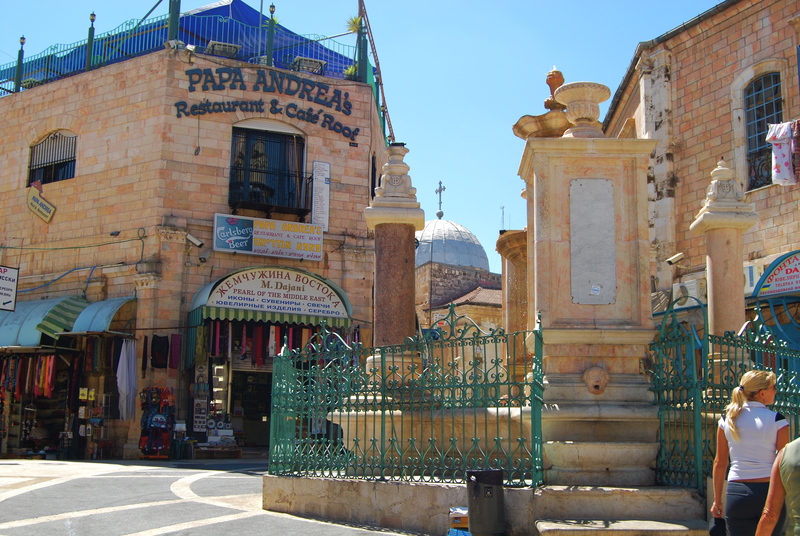 Adjacent to the Catholic chapel is the Greek Orthodox Calvary, which contains the actual Rock of Calvary (Station 12) around which the church was built. 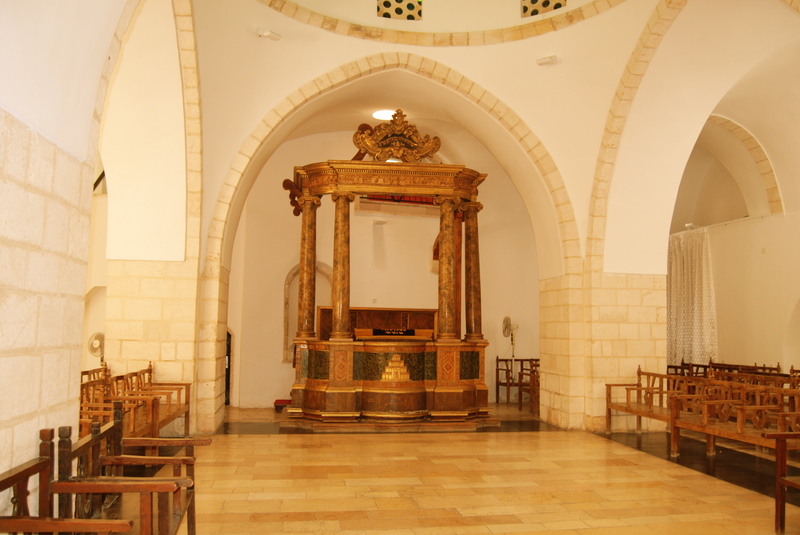 This is the Altar of Crucifixion. Here, according to tradition, Jesus was crucified. 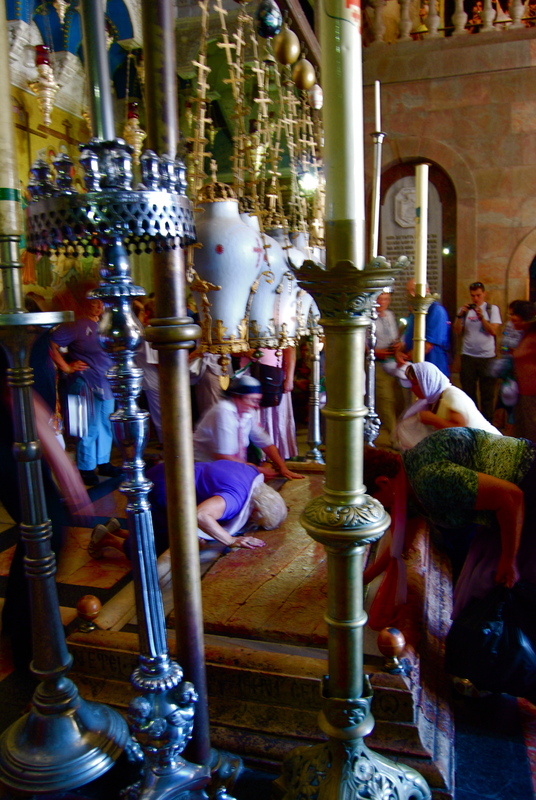 Down from Calvary (Golgotha), the Stone of Anointing could be seen with the crowds venerating it. The wall mosaic in the entrance can also be seen. Back again to ground level, another part of the Roman Catholic section is shown here. 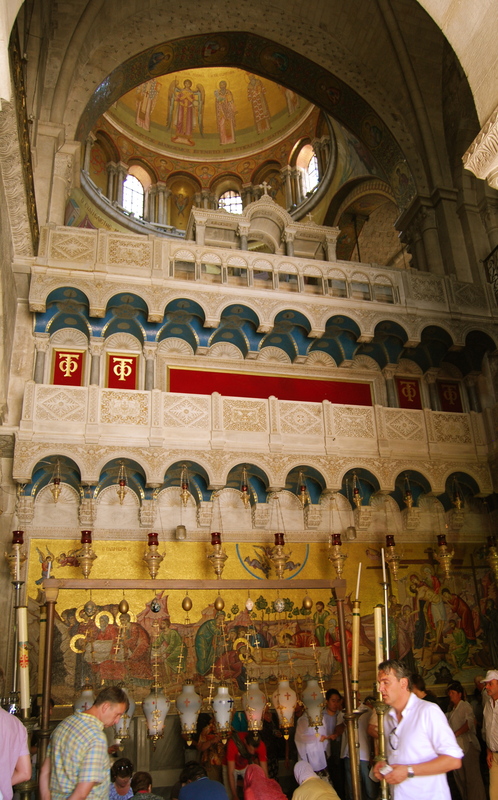 At the east end of the north aisle is the the chapel of the Prison of Christ (Greek Orthodox Chapel), which according to 12th-century tradition housed Jesus and the two thieves before the Crucifixion. 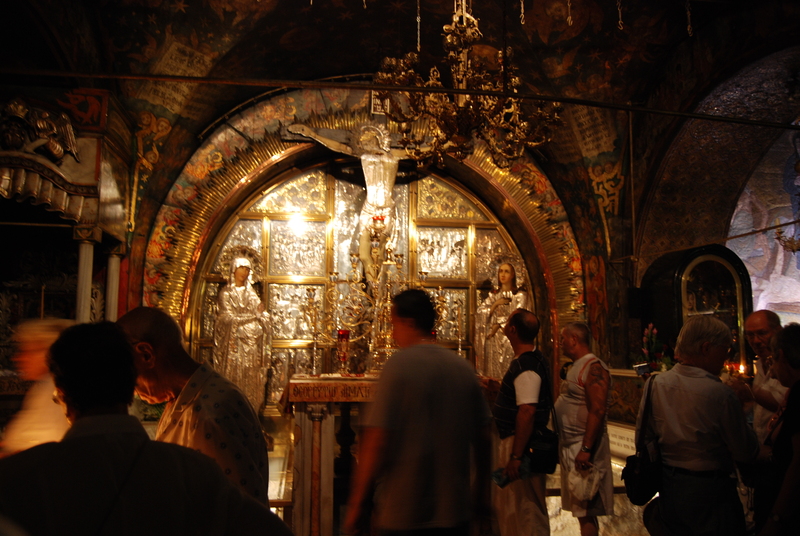 Inside the Prison of Christ. 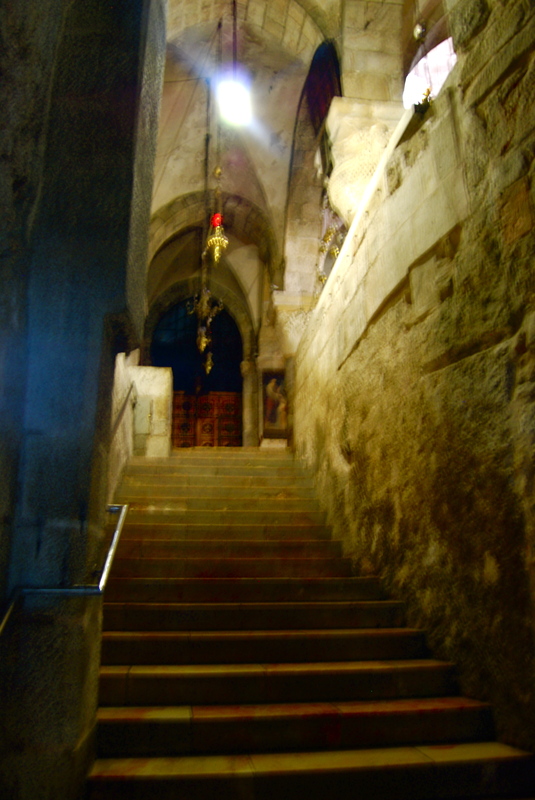 I then took a stairway that descends to the large Chapel of St. Helena, which is owned by the Armenians and known to them as the Chapel of St. Gregory. 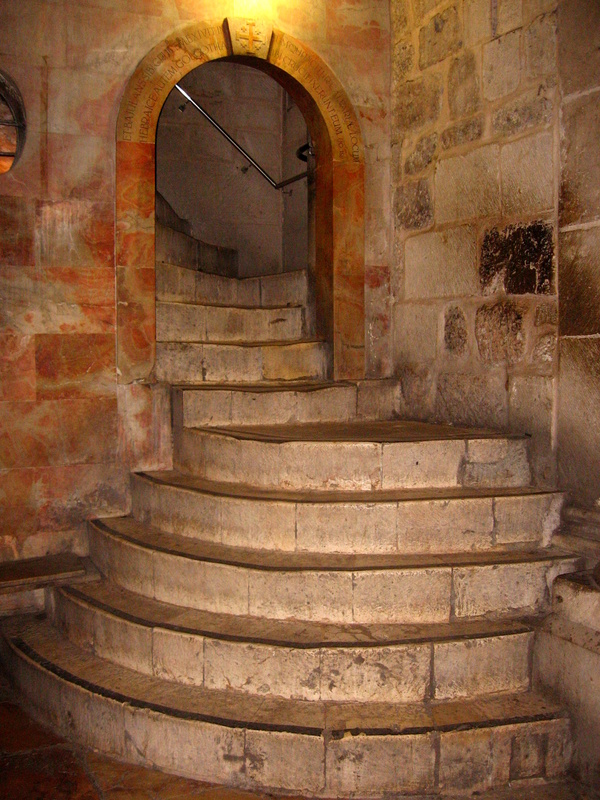 On the stairway walls are many small crosses carved by medieval pilgrims. 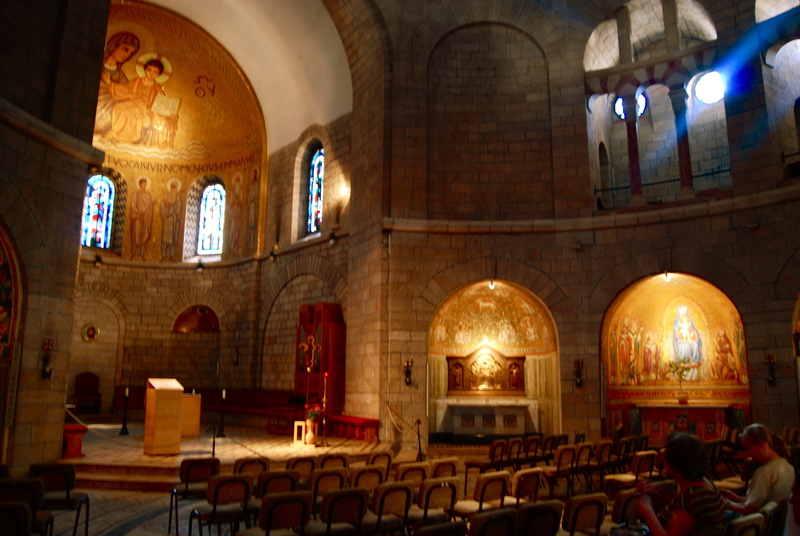 The chapel has three aisles and two apses: the north apse is dedicated to the penitent thief; the south apse to St. Helena, mother of Constantine. A seat in the southeast corner of the chapel is said to have been occupied by Helena as she searched for the True Cross, a story first mentioned around 351. From that corner, I descended 13 more steps into the Chapel of the Finding of the Cross. The left side is owned by the Catholics, whose altar features an eerie, life-sized statue of St. Helena holding a cross. The Greeks have the right side of the chapel. 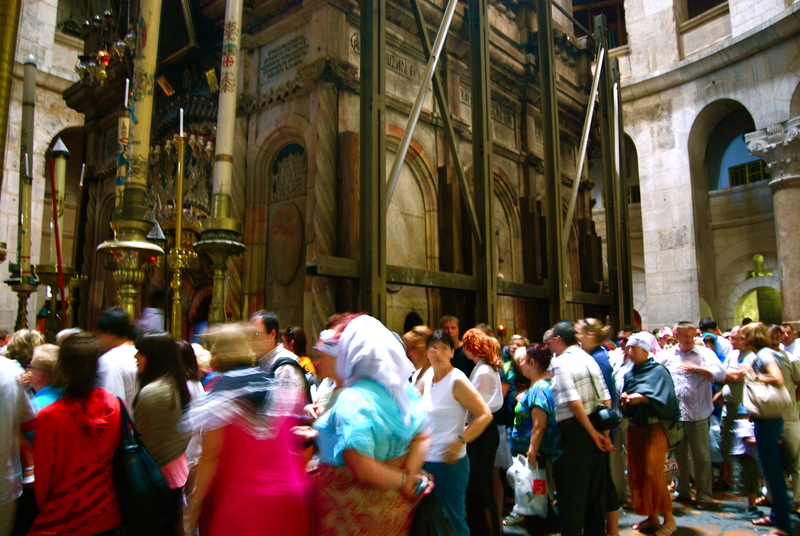 Shown here are Korean tourists and that ended my tour of the Church of the Holy Sepulcher, the holiest place in Christianity. 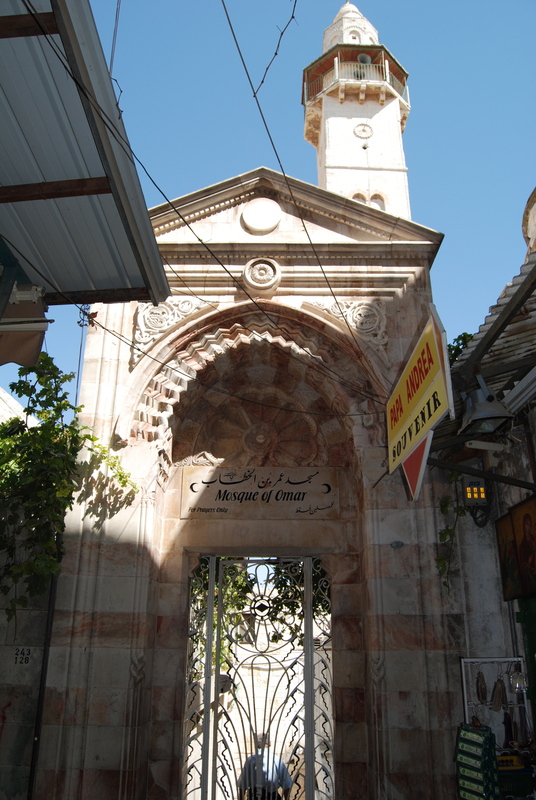 As I was walking to exit through one of the gates, I passed by the entrance to the Mosque of Omar…. …passing and stopping by shops where I bought some souvenirs, one of them was a medium-sized menorah. 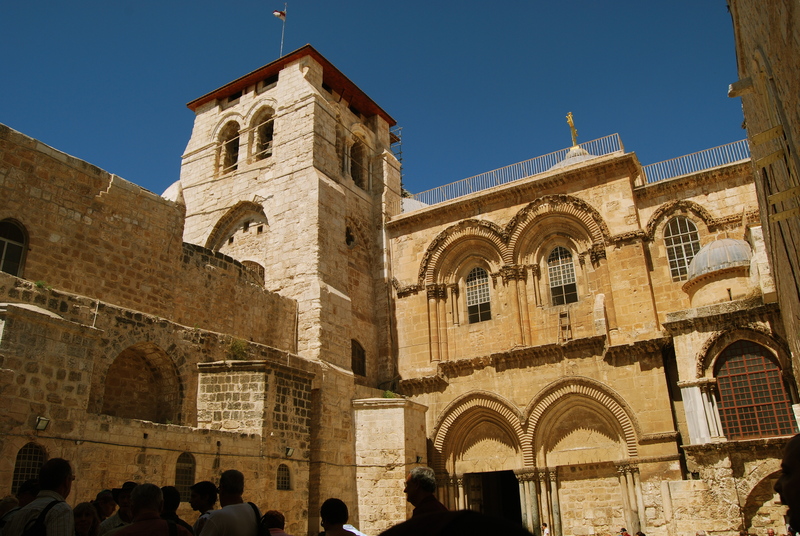 I exited via the Jaffa Gate and from the open space I enjoyed the views of the walled city…..
….that includes the view of the tower of David. 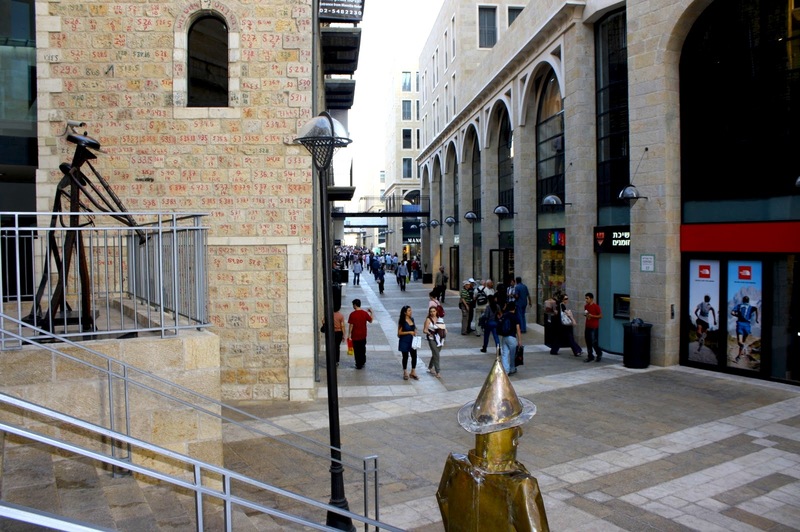 I proceeded to the nearby, modern Mamilla Mall. 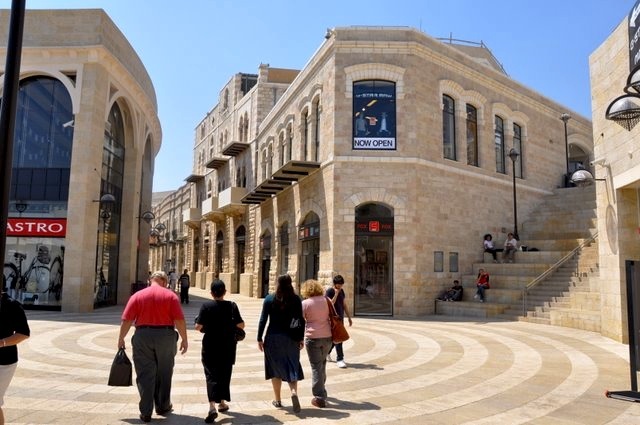 Home to some of the nicest and poshest restaurants in Mamilla, the mall features an outdoor promenade and a two-level indoor sections of fashion chain stores and boutiques. 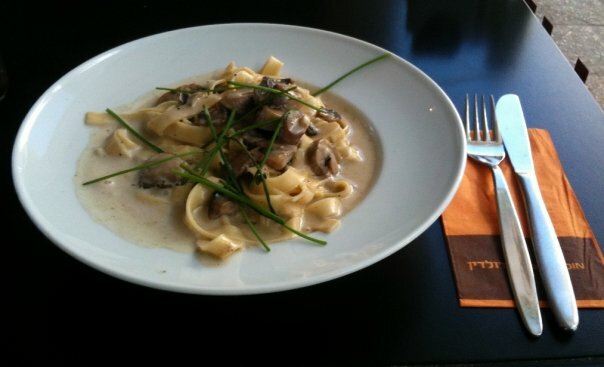 I stopped at a reasonably-priced Italian bistro to have my late lunch of alfredo fettucine. After a little shopping, I went back to the hotel. 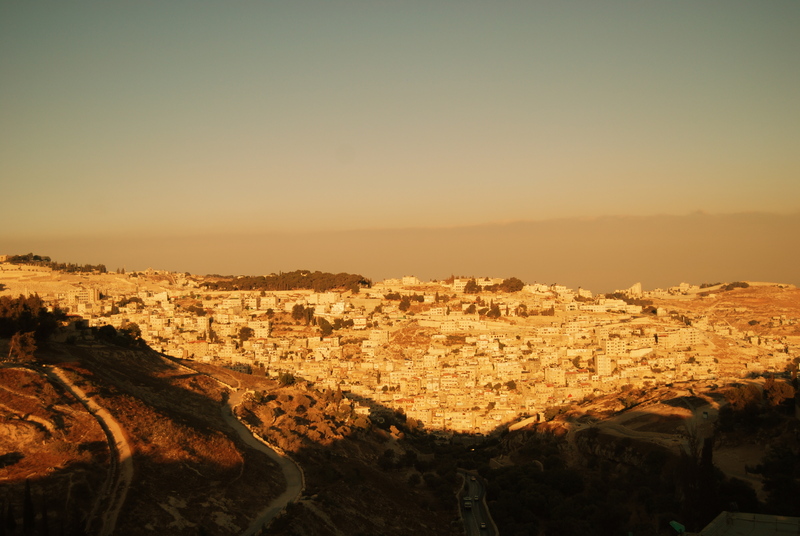 The view from my room was a stunning, golden scenery of the Kidron Valley brought about by the afternoon sun. 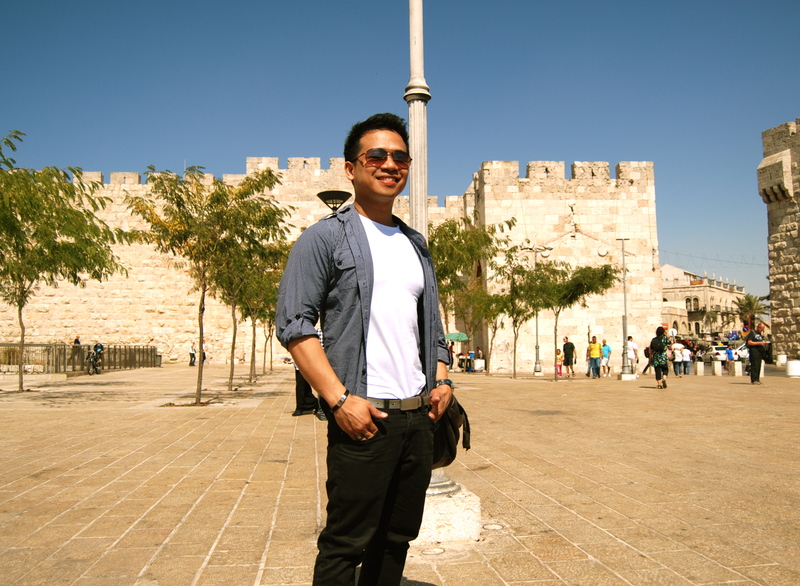 It was another memorable day….walking where Jesus walked in the Golden City. My final day in Jerusalem consisted of the quick tour to the Mount of Olives before I traveled north to Tiberias. Hi there, simply was alert to your weblog thru Google, and located that it’s really informative. I am gonna watch out for brussels. I will be grateful should you continue this in future. Many people will likely be benefited from your writing. Cheers! Hi, I have actually been to Brussels but not lately so my updates will not really be that “updated”. Nevertheless I will publish a blog once I get the chance to go there again. Thank you for your appreciation. I’m a frequent reader of your respective blog posts. I liked the recent a single as well as other content on the blog site a great deal that I get enrolled in the particular blog’s RSS feed in Thunderbird. Also thinking about taking some ideas and hang them to work. Maintain all the great work going by publishing a lot more helpful blogposts. Thanks. Occasion wisely spent for this publish. Thank you for reading and for the support! Make sure you figure out the idea worked right? My spouse and i dont want to sumit that once again basically don’t need to! Possibly the blog glitced out there as well as i will be an idiot, the other option doesnt shock us lol. appreciate your a fantastic website! Wonderful information, wonderful blogposts, will add your blog post to my own weblog with regard to my own audience to see! I will be satisfied! It is simple to see that you’re obsessed with your blog. Looking forward to future blogposts. Thank you! This post has made an excellent impact on my personal selection. Thank you! Wow. I am honored to be of help. Thank you for reading. An gripping discourse is worth annotate. I conceive that you should indite writer on this message, it might not be a sacred message but mostly people are not enough to verbalize on specified topics. To the next. 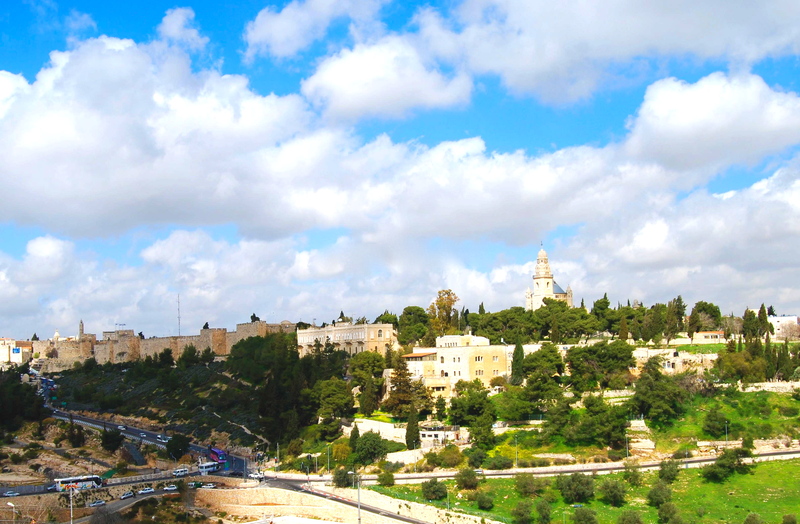 Cheers like your Israel : Jerusalem’s Mount Zion & Christianity’s Holiest Site winairtravel. An interesting communication is designer interpret. I consider that you should indite statesman on this matter, it power not be a prejudice bailiwick but generally group are not sufficiency to speak on much topics. To the succeeding. 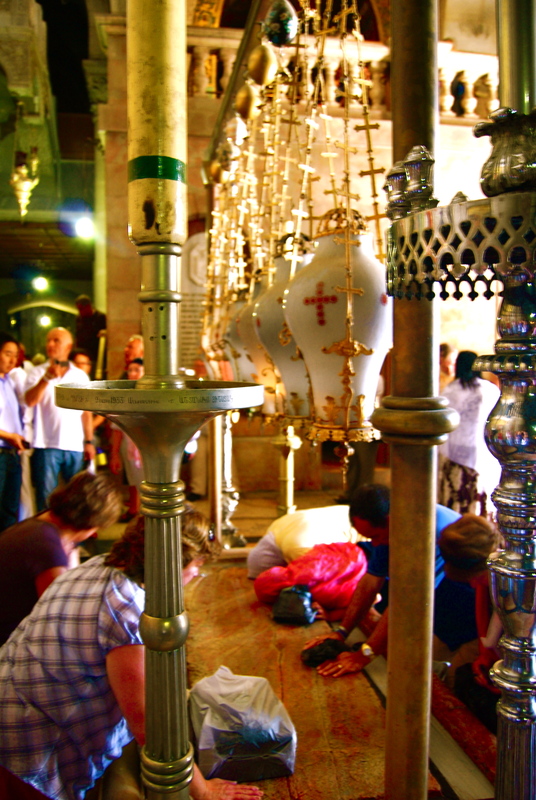 Cheers like your Israel : Jerusalem’s Mount Zion & Christianity’s Holiest Site winairtravel. An newsworthy speech is worth comment. I opine that you should indite many on this matter, it power not be a preconception mortal but mostly group are not enough to talk on such topics. To the next. 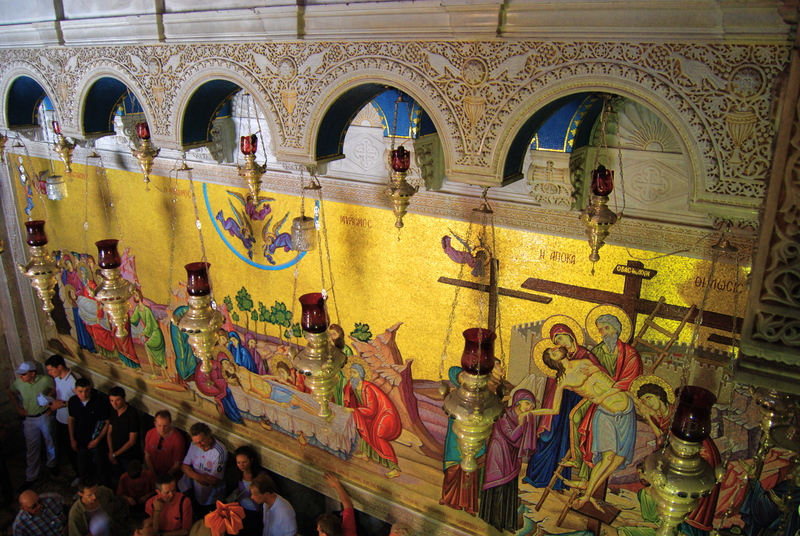 Cheers like your Israel : Jerusalem’s Mount Zion & Christianity’s Holiest Site winairtravel. Very worthwhile preparing my own supply! An fascinating communication is worth comment. I think that you should create statesman on this substance, it strength not be a bias mortal but mostly fill are not sufficiency to speak on such topics. To the next. 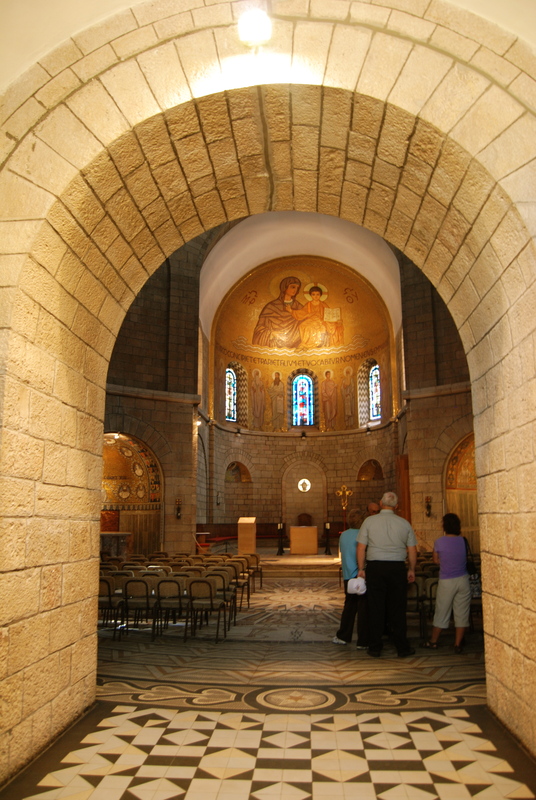 Cheers like your Israel : Jerusalem’s Mount Zion & Christianity’s Holiest Site winairtravel. My husband and i felt really more than happy Jordan could do his studies from your precious recommendations he came across from your own blog. It is now and again perplexing to simply possibly be giving away tips and hints which often men and women have been trying to sell. And we all understand we have you to be grateful to for that. The type of explanations you made, the easy website menu, the relationships you can help promote – it is mostly overwhelming, and it’s really leading our son and us reckon that the topic is pleasurable, and that’s incredibly indispensable. Thank you for all the pieces! my pleasure to be of help. thank you for taking your time to browse through my blogs. thank you also for the great appreciation. You’re in reality a excellent webmaster. The web site loading velocity is amazing. It seems that you are doing any unique trick. Moreover, The contents are masterwork. you have performed a great task on this matter! Dead composed content, regards for information. “In the fight between you and the world, back the world.” by Frank Zappa. An unputdownable communicating is worth mention. I opine that you should make writer on this matter, it might not be a sacred matter but mostly group are not enough to talk on such topics. To the next. 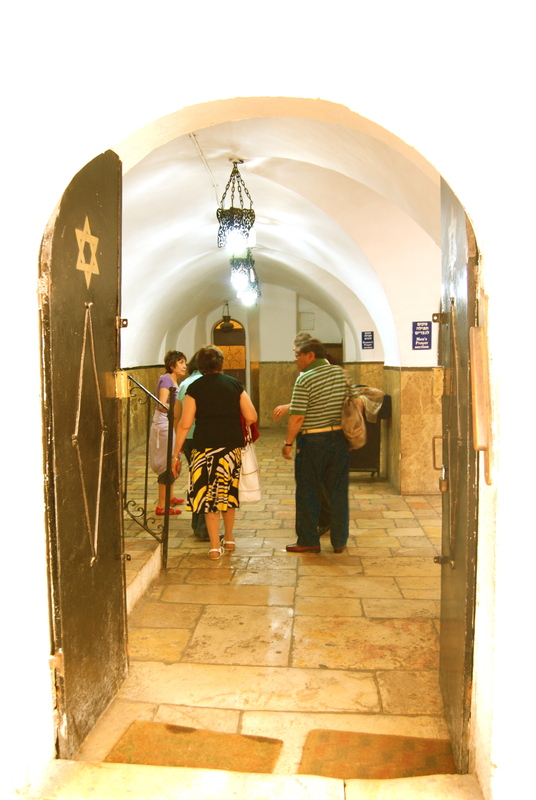 Cheers like your Israel : Mount Zion & Christianity’s Holiest Site winairtravel. An stimulating communicating is couturier report. I consider that you should compose many on this subject, it mightiness not be a sacred someone but mostly fill are not sufficiency to verbalize on much topics. To the succeeding. 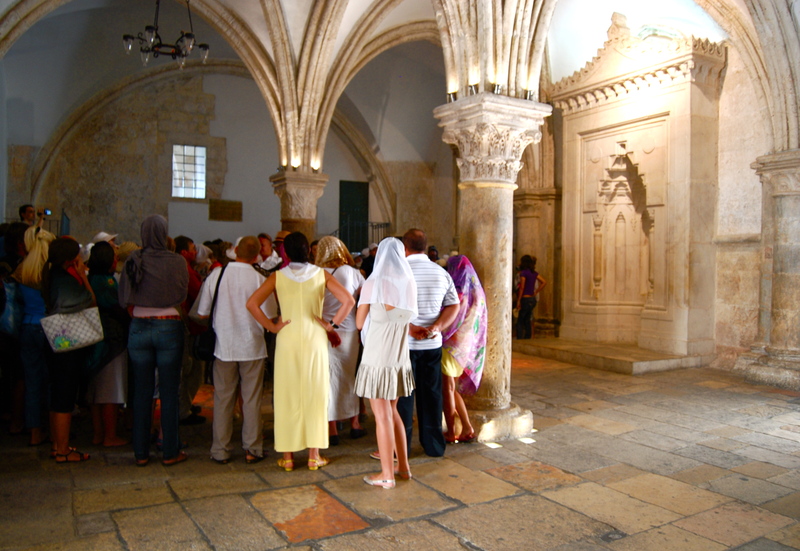 Cheers like your Israel : Mount Zion & Christianity’s Holiest Site winairtravel. An gripping language is couturier notice. I believe that you should pen author on this topic, it might not be a preconception master but mostly people are not sufficiency to speak on much topics. To the next. 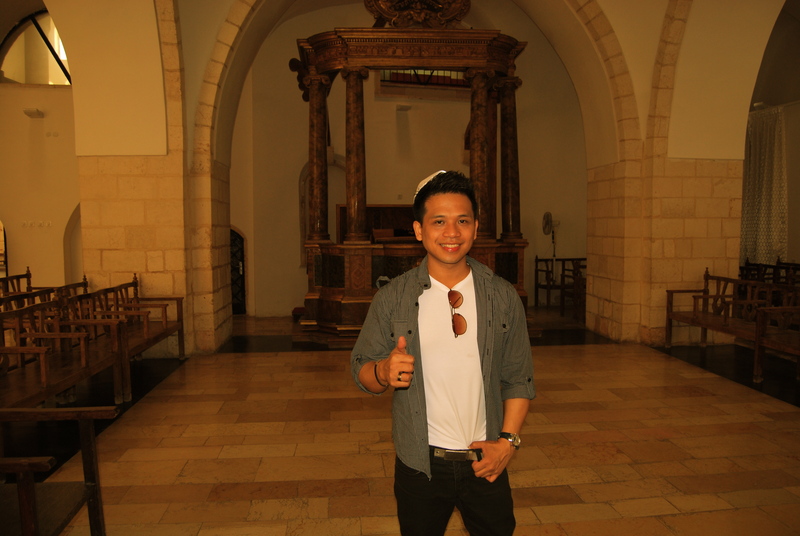 Cheers like your Israel : Mount Zion & Christianity’s Holiest Site winairtravel. Remember to inform me it worked appropriate? My partner and i shouldn’t sumit the idea again easily don’t need to! Both the blog glitced out and about or i am a fool, the other alternative doesnt amaze me personally : ). appreciate your a fantastic blog site! Well I definitely enjoyed reading it. This tip procured by you is very helpful for accurate planning. I have been exploring for a little for any high-quality articles or blog posts on this kind of area . Exploring in Yahoo I at last stumbled upon this website. Reading this info So i’m happy to convey that I’ve an incredibly good uncanny feeling I discovered exactly what I needed. I most certainly will make certain to do not forget this site and give it a look regularly. Hi Owen, your appreciation is highly important. Thank you very much! I’m commenting to let you know of the magnificent encounter my wife’s princess gained viewing the blog. She realized a good number of things, which included what it’s like to possess a wonderful coaching mindset to let the rest without hassle comprehend chosen impossible things. You undoubtedly surpassed our own expected results. I appreciate you for offering those important, dependable, edifying and as well as easy tips about your topic to Mary. Hi Emerson, thank you for the appreciation and support. Also I am so honored my blog can be of help to others like Mary. Hey there. I just simply wished to place a short statement and also inform you understand that I’ve been reading your personal website for quite some time. Keep up the very awesome task and I’ll be browsing back again again fairly quickly. Hi Milo, my pleasure. Thank you for your appreciation. thank you for your complete hard work to have devote this specific. Very fascinating data. “Laugh from you very first, ahead of someone else could. ” by just Elsa Maxwell. I merely could not leave your online site ahead of saying that I truly appreciated our prime quality information you are offering to your guests. Will probably be rear often to check on high on brand new products in you submit! Somebody essentially help to make seriously posts I would state. This is the very first time I frequented your web page and thus far? I amazed with the research you made to make this particular publish incredible. Fantastic job! Excuse me, but I attempted to email you concerning an issue on your website but the given email address did not work. Is there an alternative place I could get in touch with you? fantastic post, very informative. I wonder why the other specialists of this sector do not notice this. You must continue your writing. I’m confident, you’ve a great readers’ base already! Thanks for the blog post, how can I make is so that I get an email sent to me every time you write a fresh update? Someone told me that I need something called WordPress to make a Website like this. What else do I need? I enjoy you because of your whole labor on this blog. Gloria enjoys conducting research and it’s simple to grasp why. Almost all learn all regarding the lively form you make great strategies through this blog and cause contribution from some others on that subject matter so my simple princess is now studying a whole lot. Take advantage of the rest of the new year. You are always conducting a useful job. It’s in point of fact a nice and helpful piece of info. I’m glad you to simply shared this useful info with us. Please keep us up to date along the lines of this. Thanks for sharing. You are so cool! I do not suppose I have read through a single thing like this before. So good to discover somebody with some genuine thoughts on this subject. Seriously.. thank you for starting this up. This web site is something that is needed on the web, someone with some originality! Hiya, I’m really glad I’ve found this info. Today bloggers publish only about gossip and web stuff and this is actually irritating. A good web site with exciting content, this is what I need. Thanks for making this web-site, and I will be visiting again. Do you do newsletters? I Cant find it. Hi thank you for you kind and encouraging words. Anyway I do not do newsletters. Hope you continue to check on my blog site. Cheers! Magnificent goods from you, man. I have understand your stuff previous to and you are just too great. I actually like what you’ve acquired here, certainly like what you’re saying and the way in which you say it. You make it enjoyable and you still take care of to keep it smart. I can’t wait to read much more from you. This is really a great web site. My wife and i were quite glad when Peter could finish up his analysis via the ideas he acquired through the web site. It’s not at all simplistic to simply find yourself handing out guidelines which most people could have been making money from. And we also do understand we need the writer to thank for that. Most of the illustrations you have made, the simple web site navigation, the friendships you can assist to foster – it’s everything exceptional, and it’s really facilitating our son in addition to the family recognize that this article is brilliant, which is certainly pretty mandatory. Many thanks for the whole lot! Hi. Thank you very much. I am glad I was a help! This kind of really solved my own issue, thanks a lot! Hi Dwain, you are most welcome! I am humbled. Hi Joella! Nice to hear your encouraging appreciation! I hope you continue to support my site and recommend it to your friends. I am happy I have enticed you to read my blog! Have a nice day! Hi there, You’ve done an excellent job. I will certainly digg it and personally recommend to my friends. I am confident they will be benefited from this website. thank you for the appreciation. i hope you continue to support my blogs and recommend it to your friends! cheers! thank you for visiting my site. please do continue to support and visit often! Hi, my blog site is just one of the default designs in wordpress.com. Thank you for your appreciation. Thanks for your entire effort on this blog. Kate loves participating in research and it’s really easy to see why. My spouse and i know all about the powerful way you make very helpful items through the blog and cause contribution from some other people on the concern so our own child is studying so much. Enjoy the remaining portion of the year. Your conducting a wonderful job. I only tested this in Safari browser as this is the default design. Sorry for the inconvenience caused and thank you for the feedback.